For any one that remembers the Lava Lamp, you might remember how interesting and popular this item was. The Water Motion Liquid Bubble Timer brings back the basic concept of the Lava Lamp, yet this product has different function, it acts as a timer, but is really so much more. For what it is, the Water Motion Liquid Bubble Timer has become quite a popular product for people of all ages. It’s basically made of plastic and has a hourglass exterior style. Inside it is water and the oil, which forms the bubbles, and they take approximately 1 to 2 minutes for each bubble to rise or fall to the bottom. 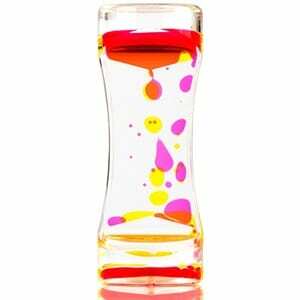 Very much like the Lava Lamp, the Water Motion Liquid Bubble Timer is extremely hypnotic and it really acts as a distraction for both kids and adults alike. The Water Motion Liquid Bubble Timer is a pretty simple product, but it seems people have found that it works great for kids in many situations where time is a factor, and is even used as a therapy tool in some cases. For example, if you are disciplining your child and you want to give them a timeout, simply sit them in front of the Bubble Timer. Another example is when they are brushing their teeth and you want them to do so for a period of time, it makes it far more fun for them to use the timer to gauge how long they’re doing it. As far as a therapy tool, because it is a sensory focus toy, the Water Motion Liquid Bubble Timer been used in the treatment of children with Autism, ADHD and many other hyperactivity issues. It helps to relax the nerves, calm anxiety and seems it helps to focus their mind. Again, anybody that has ever had a Lava Lamp remembers how great they were and this is very much like what they were like way back when. They’re great for your office desk, your kitchen counter, the bathroom sink and even the dresser. Anytime you want to just sit back and relax for a minute or two, the Water Motion Liquid Bubble Timer really does work to help relax you. Right now you can get this at Amazon for $7.99. The commitment of the Water Motion Liquid Bubble Timer is pretty basic in the sense that it will work to act as a relaxation tool as well as an actual timer. Its great for kids of all ages, as well as adults, and all will enjoy watching the bubbles rise and fall and the relaxation it provides. If you’re the type of individual that enjoys this type of sensory product, then the Water Motion Liquid Bubble Timer might be something that you would enjoy. If you have kids, especially those with hyperactivity problems, based on the reviews, it seems parents really do find this a useful item to have. As stated, based on the reviews, it seems adults that have bought it enjoyed the relaxation factor and use it to a zone out for little while when they’re stressed out. Kids enjoy it and it seems the Water motion Liquid Bubble Timer is functional as well as fun. If you are looking for other toys that come into the educational category then check out the Q Challenge Set. What do you think? Does the Water Motion Liquid Bubble Timer work or not?